She had a good day. I was reminded of a Facebook memory today. 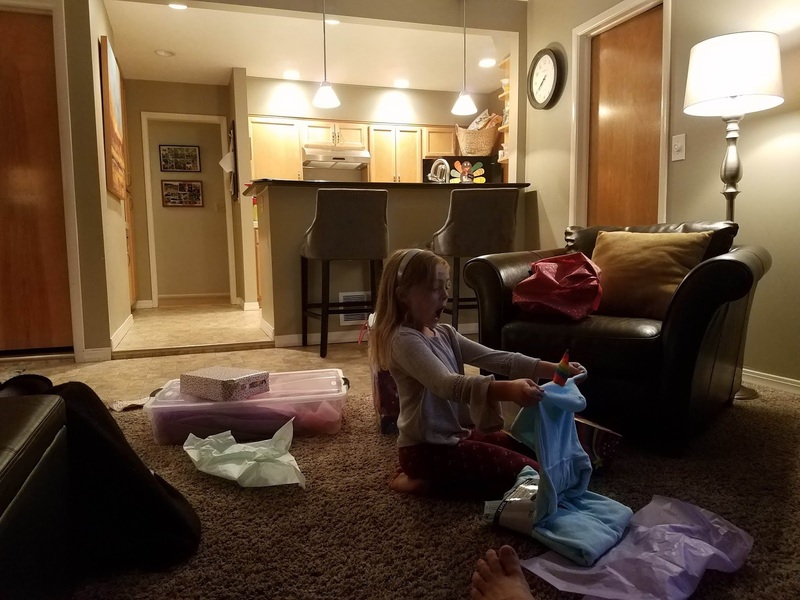 Below it was I wrote to her when she turned 5. It seems even more appropriate today as I can see her becoming more and more like this every day. She's Hayden and we are just living in her world. May you rejoice at being yourself. May you follow the song in your soul. May you wander confidently outside the flock. May you know the exquisite happiness of love. May you travel the world, learning along the way. May you face life's inevitable challenges with curiosity, not fear. May you always appreciate the qualities that make you uniquely beautiful. May you contribute something special to the world, something only you can give. It's an honor and a joy to be your mommy and daddy. She was excited that she got a new unicorn stuffed animal. Her name is Fluffy. 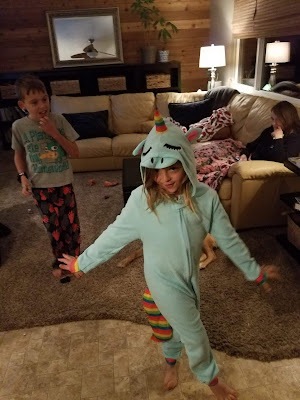 She was even more excited to get some unicorn jammies. And she was more than happy to be a unicorn model. I will not talk to you tomorrow but I will talk to you next week. Thank you for being here and stopping by. I really do appreciate it. Have a wonderful Thanksgiving and wish me luck as I venture out to my first Black Friday in less than 48 hours. Sweet Lincoln's mullet, I am an idiot. It was my pleasure to visit every day. Thank you. Love the photographs of your daughter, she definitely enjoyed being 7. Have a good week. Happy Birthday to Hayden! She makes a beautiful Unicorn. We don't celebrate Thanksgiving here in the UK but have a wonderful time! Abby and Tar wish Frizzle lots of turkey scraps. Holy moly, those are great things to wish on a new person. I always love your gifs. Fantastic. That is a thoughtful and wonderful poem for your daughter.